I’m not very good at setting goals. Scratch that. I’m great at setting goals…it’s following through with those goals that trips me up. And then…I had a milestone birthday. On the inside, I still feel like me. My brain doesn’t feel like it’s getting any older. Everything’s rattling around up there. Hampster’s on its wheel. My knees and wrists know I’m aging, but who wants to talk to a knee? However, that underlying feeling, the one that reminds me I won’t be on this planet forever, the one that knows I can’t put off living my life any longer, that voice that’s telling me, “You’ve got stuff to do and you’re running lower on time with each day that passes.” Yeah, that feeling? That voice? It’s getting louder. After I turned forty-one, I started to measure my age in months. For example, on the 23rd of September, I will be 497 months. I started to think of my life in terms of milestone months like parents do with their children. Juli took her first steps at nine months old. (I guess my walking skills were advanced. LOL) Juli got a new job at 494 months. (She’s such a big girl!) I use my birthday as my marker and try to have something, anything, to show for my new milestone month. It’s a different way to look at life, that’s for sure. Better still, I’m actually making tangible changes in the way I live. Each month needs to count. My days may not be perfect, but in the end, they need to add up to something. Did I learn anything new? Did I try something I’ve been putting off? Is there something good that came out of another month of Juli on this planet? Am I closer to the place I want to be at in my life? Am I closer to my goals? Am I making my dreams a reality? It’s a little early for me to set goals for the next milestone month. According to my calculations, I still have nine more days before September’s monthly self-evaluation. Ah well… I already had a few goals in mind. I suppose I’m game to share them. Last Week’s Watercolor Painting. Abstract painting is fun! Create one new painting a week. 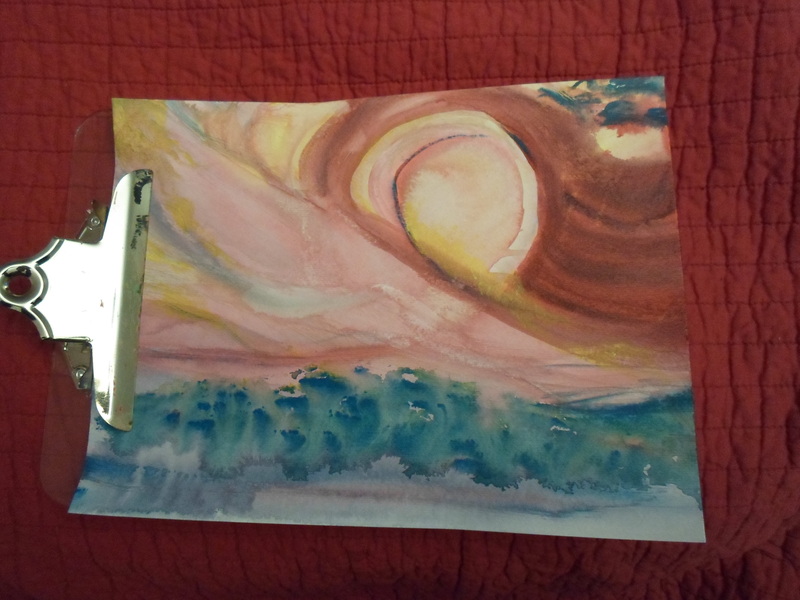 I always wanted to play at watercolors, but I was afraid to try. I haven’t had an art lesson since my teens, maybe even my pre-teens. What do I know about painting? I’m not a brave person. Why should I start this late in the game? Because it’s FUN! Because painting makes me feel like a kid again. I bought a set of watercolors on another milestone month, but I haven’t done nearly enough exploring with them. A new painting a week, seems like a great way to relax, to connect with the creative part of me. Write one new sentence in my work in progress each day. This is not a new goal, but it’s not a habit yet either, so it’s still on my list. I still catch myself worrying about word counts or the clock when I know I should be concerned with consistency. Some days, I will be able to write several pages, and other days I will struggle to write one sentence. If I’m able to write only one new sentence per day, both scenarios are acceptable. Both scenarios bring me closer to reaching my goals as a writer. Go for a walk three days a week. The weather is turning cooler. Soon, the fall leaves will be in color. I spend most of my time indoors. I don’t need to walk far. A simple walk around the block is good enough. And isn’t that what living’s all about? It’s not about perfection. It’s about enjoying the world around me. It’s about carving out time in my schedule to enjoy what’s important, and worrying less about the stuff that doesn’t count. Besides, walking is conducive to thinking…or not thinking, depending on the day. *This completes my first assignment for Blogging 201. I have great admiration for anyone who’s able to beat watercolours into submission. I’ve never been able to. LMAO!!! Thanks, watercolors in tube form give you a LOT more control. You can use them straight from the tube like acrylics, or water them down like traditional watercolors. I’ve stopped counting my age the moment I joined the 30s club. Hmm…how many years ago was that? Haha 🙂 Time passes faster than it used to be each year. What a great way to look at things – by the month. I like that. I’ve seen several blogging things that do it by the week and have thought about joining but some weeks are just a wash and then I’d have the “well, what a waste” guilt to fight…but I don’t think any month has ever been a complete waste where there wasn’t something to look at, something to say “I did this”. I like it! There’s always SOMETHING in a month’s time. I find using my birthday works better than a traditional month. First of the month to the end of the month often gives me headaches because that’s when bills are due, etc. Twenty-third to twenty-third…less stressful. Nice! I wondered why you said your “end” was almost here! It panicked me for a second that I was off a week Lol!